Are you short on cash and looking for some ways to make a little extra money on the side but not sure where to start? With 21 Side Hustles You Can Start Now, you can find 21 different side income ideas that you can get started on today. You won’t have to spend any money to start any of these these ideas as I have only given you ideas for side hustles that require things you already own. Not every idea will appeal to you, but there is something listed for everyone. 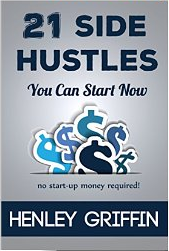 The ideas in this book can take you anywhere from a few hundred extra bucks per month to a few thousand extra bucks per month. And if you are interested in leaving your current job, some of these side hustles can easily transition into a full-time hustle for you.